Unlike other cream shadows, which dry upon application, Chanel’s beautifully sleek eye glosses remain moist. Not only does this create a subtle sophisticated sheen, but it also allows the gloss to be blended with powdered and other cream shades for a more intense colour. This exquisite limited edition Luminous Cream Quadra Eyeshadow offers four rich deep colours, so perfect for the coming autumn and winter that they will make you want to dust of your winter coat, hat, scarf and gloves and go and roll around in a pile of leaves. The current compact will be followed by the September release of the white collection, for dewy sparkling eyes. Often cream or liquid shadows that promise a high sheen effect, don’t quite live up to expectations. It is difficult to strike a balance between keeping the shadow moist (which is how the sheen is achieved) and also providing staying power so the shadow does not have to be constantly reapplied. 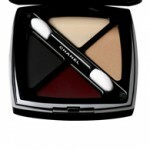 Chanel seems to have found a perfect balance, so even though this product is at a high price point (£38.50), it is worth every penny if you want to achieve a stylish but distinctive look this autumn.